As Mera, The Flash and Superman try to fight Black Manta's forces, Wonder Woman and a newly powered Aquaman are trying to convince Poseidon to save Earth from the alien sea gods. The abilities Black Manta stole from Arthur Curry are the key to defeating them. However, there isn't much time to use them to imprison the evil beings in the Graveyard of the Gods. Cheetah has every intention of destroying it to eliminate Wonder Woman. A paralyzed Batman is using Kryptonian battle armor to battle the Legion of Doom. He's not happy at all that they're trying to take the Totality. Yet, he may not have much time to stop them. While Aquaman has been given Poseidon's trident to use the Tear of Extinction upon. [You'll recall Black Manta stole it]. Arthur may not be able to save Earth for a Death Kraken is about to be unleashed drowning the planet further. Story - 5: Okay, we get a lot of exposition from Poseidon, some character moments that define Black Manta and Cheetah and Batman kicking the Legion of Doom's butts as he put it. In all seriousness, this issue isn't as good as previous chapters, but it still merits a maximum score. 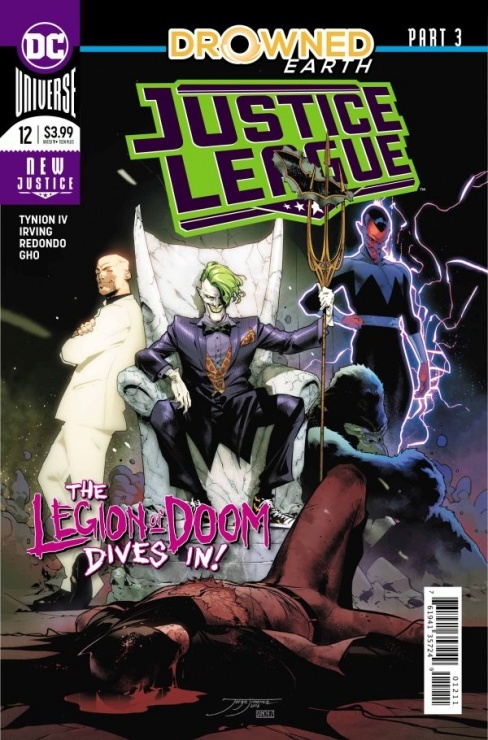 This is still a must read title, perhaps the best DC is publishing at the moment. Art - 3: I'm no fan of two or more different artists working on the same issue for the most part. It disrupts how I like to see the comic. The art itself is well done, but changes in styles is jarring, making what could be a perfect comic reading experience a period of adjustment between pages. Cover Art - 5: Jimenez did a great job with this one. Joker reminds me of Prince (I'm a fan of his music) in "Partyman" for some reason. 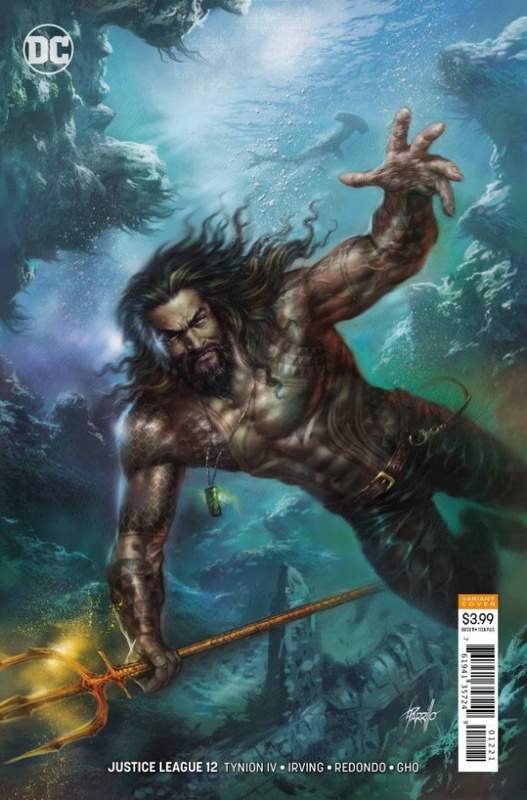 Variant Cover Art - 5: Another great image of Jason Mamoa just in time for the movie. It merits the rating, but is all the hype worth it? We'll see.